These sweets are originally from Portugal and were brought over to Thailand by Portugese settlers, initially to the settlement in Ayutthaya but then spreading across Thailand to other Portugese settlements, they became popular with both the Thais and of course the Portugese at the time and still are today. 1. 1 ¼ cup Flour (Wheat flour). You can use All purpose flour instead for it. 2. Coconut cream 4 grm. 3. Sugar 3 ½ cup. Many other ingredients are optional such as pandanus leaf, colorings, flavorings, etc. 2. Add coconut cream a little at a time, mix well until sugar dissolves. 4. Cook over medium heat until mixture looks clear. 5. Dropped by cookies bag. 7. In Thailand they flavour with aromatic candle (edible) but you can add vanilla extracts etc instead. 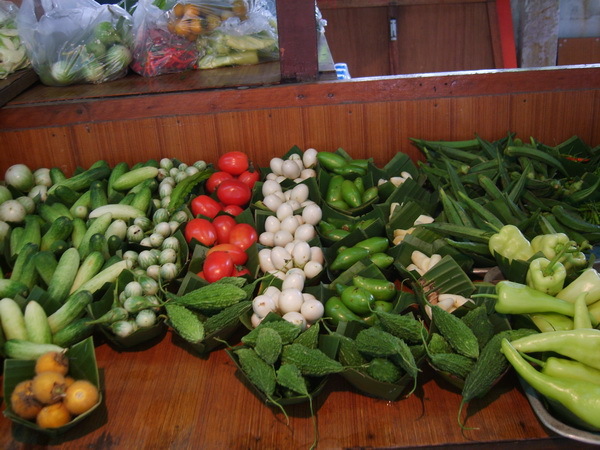 Note the lovely bright colours, better colour than the originals vegetables, popular all over Thailand.